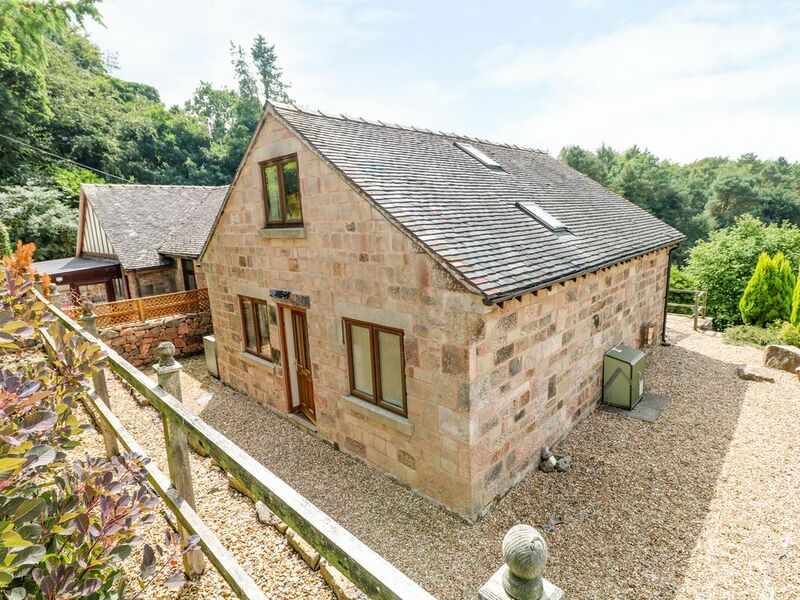 This lovely stone cottage is located in the town of Biddulph, on the Staffordshire-Cheshire border, and can sleep up to six people in three bedrooms. Hurst Cottage is a detached cottage located in Biddulph, near Congleton, Staffordshire. Sleeping 5 in total, It hosts three bedrooms; a double and two twin bedrooms, along with a bathroom, shower room, kitchen/diner, sitting room and conservatory. Off-road parking is available for cars. The property also features a beautiful terraced garden, with patio and furniture. Hurst Cottage's close proximity to the countryside and major cities make it an excellent base for a break in the Staffordshire Moorlands. Amenities: Oil central heating with gas effect fire. Electric oven and hob, microwave, fridge/freezer, washer/dryer, TV with Freeview, WiFi. Bed linen and towels inc. in rent. Fuel and power inc in rent. Off-road parking for 2 cars. Garden with patio and furniture. Sorry, no pets and no smoking. Shop 12 mins walk and pub 5 minutes walk. Note: Property is on a hillside, steep drive with and steps, garden is on different levels - guests should park their car next to the owners double garage. Note: Due to different levels in the garden, and drive, this property may not be suitable for those with limited mobility. Note: This property is only suitable for children 5 years old and above. Note: This property is for holiday makers only. This property does not accept stag/hen or similar. This property has a good housekeeping bond of £100.00. Please enquire with the office before booking if your stay will be for business or work purposes. Note : Although there's beds for up to 6 people, the property does have a maximum occupancy of 5 people. Region: The North West of England has something for every discerning traveller. Whether it is the fabulous sandy beaches of its famous seaside resorts or the historic backdrop of some of the country's oldest cities, it has something for everyone. Town: Biddulph is known as the Garden Town of Staffordshire and prides itself on the floral display throughout the town which can be seen from spring through to late autumn. There are plenty of places to visit from the National Trust owned Biddulph Grange, featuring oriental pergolas and Scottish glens, to Biddulph Old Hall which was constructed in the 1500's. The town has country parks to explore, and the short distance to the Peak District National Park makes it a hit with hikers. Jodrell Bank Observatory is just 15 miles away with Alton Towers 22 miles. All within easy reach are the Staffordshire Moorlands, Derbyshire and the Pennines, and for a day out, why not visit Chester, Liverpool or Manchester. Over two floors. Three bedrooms: 1 x double, 1 x twin, 1 x ground floor twin. Bathroom with shower attachment on the bath, basin and WC. Shower room with shower, basin and WC. Kitchen/diner. Sitting room with gas effect log burner. Conservatory. Oil central heating with gas effect fire. Electric oven and hob, microwave, fridge/freezer, washer/dryer, TV with Freeview, WiFi. Bed linen and towels inc. in rent. Fuel and power inc in rent. Off-road parking for 2 cars. Garden with patio and furniture. Sorry, no pets and no smoking. Shop 12 mins walk and pub 5 minutes walk. Note: Property is on a hillside, steep drive with and steps, garden is on different levels - guests should park their car next to the owners double garage. Note: Due to different levels in the garden, and drive, this property may not be suitable for those with limited mobility. Note: This property is only suitable for children 5 years old and above. Note: This property is for holiday makers only. This property does not accept stag/hen or similar. This property has a good housekeeping bond of £100.00. Please enquire with the office before booking if your stay will be for business or work purposes. Note : Although there's beds for up to 6 people, the property does have a maximum occupancy of 5 people.